The Ryan Russell Memorial Pipe Band is a youth pipe band in the Greater Toronto Area open to people aged eighteen years and under. Although relatively new, the band has been fostered by over one hundred years of pipe band experience through its association with the Toronto Police Pipe Band. 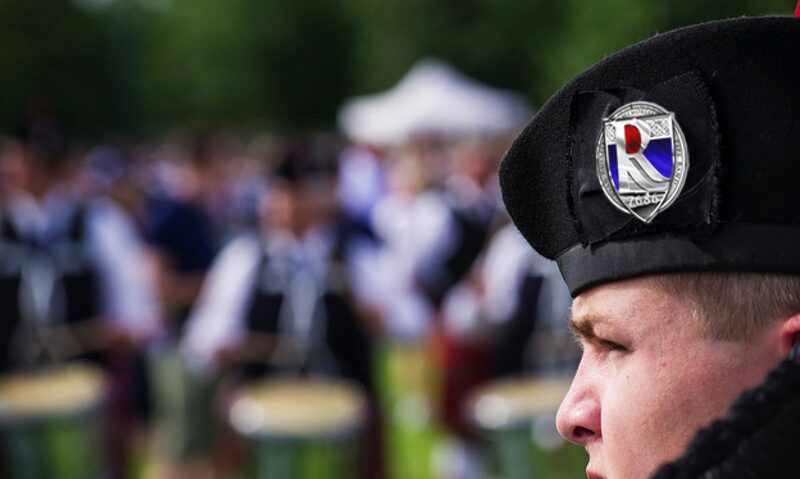 The Band’s mission is to mentor and develop youth in the art of Highland piping and drumming, thereby preserving the memory of Sergeant Ryan Russell #7686, along with his bravery, courage, and competitive spirit. He began his career at 54 Division. Due to his policing excellence, he was later transferred to the Integrated Gun & Gang Task Force where he continued to excel. In 2011, he was promoted to Sergeant and was transferred to 52 Division for his first posting as a supervisor. A great admirer of pipes and drums, Ryan had many close friends in the Toronto Police Pipe Band. This included Ryan’s best man at his wedding, who still is a piper in the band. It is only fitting then, that a memorial pipe band be named in his honour, that will encourage and teach the youth of tomorrow this wonderful art. Brian Urkosky began piping lessons at the age of 13 with Pipe Major John MacDonald, of the Metropolitan Toronto Police Pipe Band. Since that time, he has received tuition from Pipe Major Ian K. MacDonald in light music and Ceol Mor, and actively competed in solos, until he reached the Grade 1 level. In 1992, he joined the Metro Toronto Grade 2 Pipe Band, and in 1998 became the Pipe Major of the Toronto Police Grade 4 Pipe Band, leading it to three North American Pipe Band Championships. In 2007, Brian established a new junior Grade 3 Toronto Police Pipe Band, which he led to a North American Championship in 2011, and three PPBSO Champion Supreme Awards. In 2013, the band travelled to Scotland to compete in the World Pipe Band Championships, and finished 6th in the Grade 3B category – this is thus far Brian’s proudest piping achievement! The Ryan Russell Memorial Pipe Band was formed under Brian’s leadership in 2013, and with the help of family and friends, made its first competition performance in 2014. In August 2018, he led the band onto the field at the World Pipe Band Championships in Glasgow, Scotland – the first international competition experience for most of the young members. While in Glasgow, the band also performed at the Piping Live! Festival. Outside of piping, Brian is a member of the Toronto Police Service, and holds the rank of Detective. Ian K. MacDonald began playing at age of eight years old, and was taught by his father, P/M John MacDonald. At thirteen, he received instruction from Jim McGillivray, who introduced him and his older brother Craig to Piobaireachd. In the same year, he joined the Toronto Police Pipe Band and became Pipe Major in 1996. In 1995, he won the Canadian Gold Medal, and in 1997 won the “A” grade Strathspey and Reel at Oban and Inverness. In 2016, he became the twelfth piper in history to win the “Double Gold” medal at Oban and Inverness in Scotland, and received a second invitation to the prestigious Glenfiddich Piping Competition at Blair Castle. In 2017 he won the Dunvegan Medal in Skye, 2nd in the Senior Piobaireachd at Oban, was awarded the Ontario Champion Supreme for Professional Piping. Also that year, he was the Piper for Grade 3 Snare Drumming Champion Cameron MacDonald, who happens to be his son! Ian K. is a Detective with the Toronto Police Service and proud husband to the beautiful, Brenda and father to Colin (18), Cameron (17, who is also a snare drummer with the Ryan Russell Memorial Pipe Band), and Ashlyn (15). Doug Stronach is one of North America’s top pipe band players and educators. He is a World Junior Solo Snare Drum Champion, winner of the Scottish, British and European Championships, as well as multiple top-six World Championship finishes with bands both in Scotland and Canada. He was the leading drummer of the Toronto Police and Peel Regional Police Pipe Bands with two Grade 1 North American Drum Corps Awards. He recently retired from competition with the six-time World Champion Simon Fraser University Pipe Band from Vancouver, BC.He has taught and played throughout the world including Canada, USA, South America, South Africa, Zimbabwe, New Zealand, France, Germany, Sicily and the UK and has authored five books on Pipe Band Drumming including North America’s best-selling beginner tutor book. Doug is an accredited judge and holds the highest level of certificate in drumming from the combined Royal Scottish Pipe Band Association, The Army School of Piping and Drumming, and the Institute of Piping, known collectively as the Piping and Drumming Qualifications Board. He is a qualified assessor for the Royal Scottish Pipe Band Association’s Piping and Drumming Qualifications Board. You can contact Doug directly through his contact page here. Hector Macdonald is a well-known piper who has been involved in the pipe band community from a young age. He was first exposed to the music of Scotland by his parents, and received instruction from Terry Cleland, Bill Livingstone, and George Campbell. Hector was a successful Open class soloist and is now an adjudicator at the various Highland Games in Ontario. He spent many years playing in Grade 1 bands, competing in North America and Scotland. He also spent a fascinating year playing bagpipes while living and working in Japan and travelling throughout the Far East. He brings intense passion for the music and a deep knowledge of the instrument, and wants to pass on that knowledge to the next generation of pipers. Hector is a Police Officer with the Toronto Police Service. He is married to Denise, a Highland Dance adjudicator. Hector is the proud father of Malcolm and Alexander, who both play the pipes. Malcolm is an alum of the RRMPB and Alexander is a current member of the band. Jeff Redford has been a member of the Toronto Police Service for the past twenty-one years. He started his piping career in 1996 with the Halton Regional Police Pipe Band. He then joined the Grade 3 Toronto Police Pipe Band in 2004 as a competitive piper, winning Champion Supreme several occasions. PM Brian Urkosky asked Jeff to assist the RRMPB as a mentor in teaching the young pipers. Jeff’s knowledge, experience and patient approach has been a valuable addition to the mentoring team. Jeff recently retired from competitive piping to focus on mentoring the RRMPB. Mackenzie Chamberlain began his drumming career with the Sarnia Legion Pipe Band. He then moved to the Grade 4 Penetangore Pipe Band in Kincardine, Ontario, before going on to play three years with the 78th Fraser Highlanders Pipe Band, and compete at the World Pipe Band Championships in Glasgow, Scotland. In the 2015/2016 year, MacKenzie competed at the Balmoral Classic in Pittsburgh, PA, and Winter Storm (Grade 1) in Kansas City, winning the MSR and HP/J contests at both. In the spring of 2016, MacKenzie was upgraded by the PPBSO to the Professional Grade. Most recently, MacKenzie led the drum core for the Ryan Russell Memorial Pipe Band in the 2017 season. He has received instruction from many knowledgeable and talented Drum Sergeants, including Deb Whittall, Gerry Radford, Jeff Boyle, and Drew Duthart and is currently a student of Doug Stronach. MacKenzie is currently studying Management and International Business at the University of Toronto. RRMPB is extremely grateful and excited to have Mackenzie on board to work with our drummers.